SuiteWorld is in full swing and on Day 3, the extravaganza continues. The keynote today featured the SVP of Global Field Operations Jason Maynard who discusses the importance of alignment of mission, strategy and execution for business success. NetSuite has accumulated a huge amount of data over the years and Jason Maynard delves into how this data has been transformed into actionable insights. He explains that NetSuite now have an understanding that 3 elements need to be aligned in order for businesses to succeed. These are: Mission, Strategy and Execution. As a result of this NetSuite are researching, developing and investing in enablers to strengthen those core elements for NetSuite users. 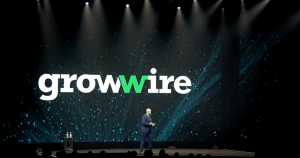 With the knowledge of how a focussed mission is so important to success, Maynard talks about how this inspired NetSuite to create the Mission enabler Grow Wire. Bringing two of the key Grow Wire team to the stage, Kendall Fisher (producer and host) and Suzy Strutner (managing editor) they talk about how the site was designed to be a place where business owners can gain tips and tools but through real stories. The site has already gained thousands of followers and the content currently consists of articles, podcasts and TV shows. Start gaining inspiration via Grow Wire today and visit their website here. In addition to creating Mission enablers, NetSuite have launched SuiteSuccess Planning & Budgeting. This was to tackle the second important element for business alignment highlighted at the beginning of the keynote – strategy. Users have been giving feedback that they needed more support for their strategic planning. The real problem here Maynard says, is that there is a gap between planning and budgeting and business operations. SuiteSuccess Planning & Budgeting enables businesses to remove the impediments to planning by 3 approaches: industry, unified and tailored. This means there is a focus on unique industry metrics, a link between strategic and operational processes and the ability to adopt increasingly sophisticated capabilities as your business grows. To roundoff the trio of elements important in business, Maynard talks about NetSuite’s enablers for better execution. NetSuite realise that the journey for each business is different which lead them to create SuiteSuccess. This was developed to ensure complete integration of sales, product, delivery and services teams. This process is continually being monitored and evolved to generate a better experience. One way this is being done is via the Advanced Customer Support. This provides continuous, dedicated support which is relavent to your industry. In addition to this, there is the Learning Cloud Support (LCS), which is on demand training 24/7. Oracle NetSuite’s Megan Biner (Industry Research Lead) and Fritz Nelson (Editor-in-Chief) were brought to the stage to talk about this exciting new development. Brainyard is a website, but it’s also a service. It’s a new access point to unlock the treasure chest of data gained from 16,000 businesses. It shares this collective insight and knowledge which will help run and grow a business. It was built on 3 pillars: Research, Benchmarking and Performance. In doing this, they wanted to make the content accessible to everybody. In this keynote Maynard has revealed how NetSuite is continually looking to provide enablers for the three elements: mission, strategy and execution. Other speakers included Mandy Dhaliwal, CMO of Boomi and Brian McClain CFO of Loud Audio who discussed the benefits they have seen through SuiteSuccess. Keoki Andrus, VP of LogMeIn who talks about NetSuite has helped him cut down the planning cycle from four days to 30 minutes. NBA legend also took to the stage and added a real entertainment factor to the event. He also gave some great words on mentorship, laughter and the value of relationships. If you didn’t attend the event, or missed the livestream, you can watch the keynote below! With Day 3 over and one more left to go, let’s see what the final day of SuiteWorld will bring. If you are unable to make the event, you can watch the live streams here.